It’s often stated that engineering review, or even a building permit, is not required as part of the construction process. “Why should we hire you?” Same reason you see a doctor when you are sick, hire a lawyer to review your family documents, hire an accountant to do your corporate taxes, and pay a mechanic to work on your car. If engineering is not required or a building codes are minimal, it’s even more paramount to work with an engineer that can ensure the structural integrity of your building. It’s your house, your lodge, your business. Do you want to go to bed at night hoping the roof is strong enough, the foundation walls won’t fail, and the builder was 100% honest when he said he knows what he’s doing? As Professional Engineers, it’s our job to review and ensure the structural integrity of your house, lodge, cabin, or other building. Our job is to make sure that the structure is strong enough to withstand building code mandated wind, snow, earthquake, live (people), and dead loads (furniture/self weight of structural members). Generally, it is the engineer’s job, education, training, and expertise, not the architects, designers, or home builder’s job to ensure the structure is strong enough. In many locations such as in the mountains, on a coast, on an earthquake fault, or on poor soil conditions, having an engineer review the structure is imperative and mandatory. As structural engineers we can also engineer a structure beyond that of code required minimums. We can engineer structures to withstand hurricanes, tornadoes, floods, burglary/theft, gunfire, and even explosive blasts. Obviously such design significantly increases the cost of the structures, but from an engineering standpoint, it can be done, and we can do it. 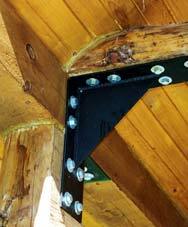 Log structures are unique in that they typically consist of irregular shaped material with unpredictable behavior. There is no standard dimension or tree species for a log, that’s not a problem for us. There are only two primary log grading systems in the United States and most engineers are not familiar with either. We are! In fact, Alex is the engineer of record for one of them! Horizontally stacked log structures also present another unique problem called settling – i.e. the logs shrink as they dry. Again, not a problem for us, we are well versed in how to deal with this and the necessary design details. Almost all of our projects we review are custom creations designed for each individual customer and their particular geographic location. Using an engineer ensures that the roof is strong enough to support a mountainous region’s snow load, the deck will support a winter’s worth stack of firewood, the second floor will hold the 600 gallon hot tub, and the china in the cabinet will not rattle as guests walk across the living room. Using an engineer also allows log members to be sized for only the specific loads induced on it. This means material is used efficiently and cost can be kept down.